Stock tanks communicate rustic charm to any indoor or outdoor decorating scheme. They’re also just darn useful. With how inexpensive they are, and how easy they are to find for sale, it would be silly not to think of all the ways that stock tanks can be used to make life easier and prettier. Use a stock tank for an above ground fish pond. It’s easy to take care of, it looks great, and you can even move it to a different location if you decide to redo your landscaping. Try doing that with a concrete koi pond! With a stock tank and a cover under your rain spout, you can set up your own rainwater collection system quickly and easily. Just make sure to check your local laws first, because you may need permission to do rainwater collection. Pair a stock tank with a fiberglass lining, and you have the makings of a luxurious bathtub at a fraction of the price of a standard bathtub. What makes it even better is the fact that you can stretch out and sink into this bathtub so much more thoroughly than you can in the regular bathtub that came in your bathroom. If you don’t have enough room for a stock tank bathtub, try putting in a shower instead. You can get away with a much smaller stock tank. With a shower curtain on a circular pole, you have the makings of a perfect rustic shower. You can set up an above ground swimming pool for a fraction of the price of a fiberglass or PVC above ground swimming pool that you might buy in the store. Just set up a stock tank, fill it up with water, and you’re ready to go! With a bit of shovel work and some ingenuity, you can easily turn your above ground stock tank swimming pool into a below ground swimming pool. Just don’t forget to leave a way for it to drain! 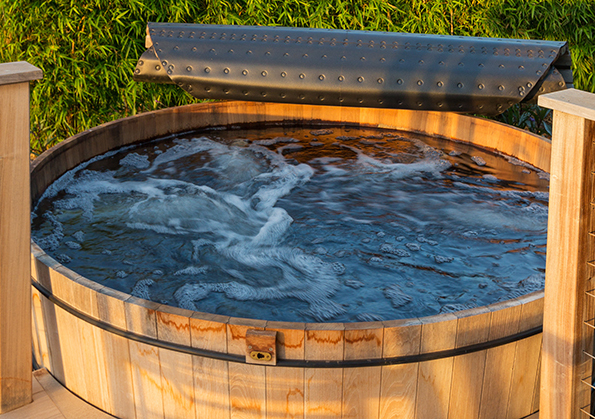 Your above ground or below ground stock tank swimming pool can easily be converted into a hot tub with the addition of a wood burning water heater. You will be able to enjoy the luxury of a hot tub at the fraction of the price of a conventional model, and at the same time you’ll be able to enjoy the cozy, delicious smell of wood smoke. This is probably the easiest stock tank hack. Just turn it upside down for an instant, rustic looking coffee table. You can even paint it to match your decorating scheme! Keep your drinks ice cold in style. Fill up a small stock tank with ice, tuck the beverages in, and let your guests dig in. It might not be quite as well insulated as an Igloo cooler, but it looks so much better! Forget about spending hours nailing boards together to make raised beds. Just set out a stock tank and fill it with dirt! However, watch out for how much sunlight the raised beds get. If you do this in full sunlight, the metal walls of the raised bed might heat the soil up too much and cook your plants’ roots. This is best to do in partial shade to help keep everything cool enough. Take a piece of wood that is slightly larger than the stock tank, cover it with padding and your favorite fabric, and pop it on top of your stock tank. Instant ottoman! As a bonus, you now have a bunch of storage space to stash things in. Some of the prettiest plants we have are also incredibly, frustratingly invasive. Bamboo is one of them. Mint is another. These plants are luxurious, gorgeous, and useful. Unfortunately, many people shy away from planting them because, basically, when you plant mint in your yard you are more or less signing up to only have mint in your yard ever again. Pop invasive plants in a stock tank planter and you’ll get to enjoy them without having to fight runners all the time. Tired of your neighbors looking into your yard? Plant some tall plants in a stock tank and stick it right in the way of their view. Since it’s in a stock tank, you can move it to another spot when the neighbors on the other side start getting nosy. Put your hose in a small circular stock tank. The size and shape are right, it looks great, and it keeps everything neat and tidy. Indoors and outdoors, stock tanks make perfect storage containers. Keep all your stuff neat and orderly in style with the rustic charm of galvanized stock tanks. This entry was posted in Stock Tank Pool, Stock Tank Spas. Bookmark the permalink. Brenan Greene is a lover of all things food, digital marketing and gardening. Brenan is the photog for the blog while Jeannette or Jnet Greene does most of the cooking.